Three Causes of Nursing Home Abuse and Neglect | Hupy and Abraham, S.C. There is not one single cause of nursing home abuse or neglect. Instead, there are several different forms of abuse or neglect that can lead to many different injuries for nursing home residents. No form of nursing home abuse or neglected should be accepted or tolerated. Instead, anyone who has been hurt by the neglectful or abusive actions of a nursing home’s staff—or loved ones of the victim—should know how to take action. Your time is limited to file a lawsuit, to recover damages, to hold the nursing home accountable for its actions, and to encourage the nursing home to make changes to better protect residents from abuse and neglect. Accordingly, it is important to identify the cause of the nursing home abuse that you or your loved one suffered and to contact an experienced nursing home abuse lawyer as soon as possible. The intentional actions of nursing home staff members. 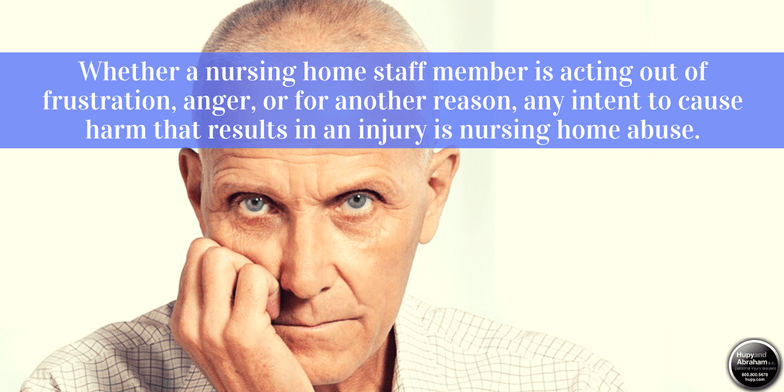 Whether a nursing home staff member is acting out of frustration, anger, or for another reason, any intent to cause harm that results in an injury is nursing home abuse. Understaffing of the nursing home. Without enough staff members to adequately care for the number of residents, a nursing home resident’s basic needs may be neglected and the resident may be hurt. Lack of training for nursing home staff members. Nursing home staff need to be trained in the facility’s policies and procedures so that they can provide reasonable care for each resident. Any of these causes can result in potentially serious injuries including malnutrition, dehydration, bedsores, broken bones, open wounds, infections, and other potentially life-threatening conditions. The one action that you should take today is to call an experienced nursing home abuse lawyer who can help you determine what caused your injury and who can help you get the recovery that you deserve. Please contact us any time via this website or by calling 1-800-800-5678.